Hearts are ubiquitous on Valentine’s Day. We all know that. The day is one of love, romance, gifts, and candy. You know you’re going to see heart-shaped candy around on Valentine’s Day. More on that later. At the moment, we’re wondering: do you know why Valentine’s Day is a day of love? Let us tell you! Valentine’s Day likely grew out of the ancient Roman festival of Lupercalia. This mid-February celebration observed the coming of springtime and honored life and love in general. Centuries later, the Roman Catholic Church converted this day into St. Valentine’s Day. Yet people’s observance of the day as one of love continued on. Valentine’s Day is what we were then left with. To do our part for this ancient holiday, let us draw your attention to some Valentine’s Day candy in bulk that has been shaped into lovely hearts. These will make great gifts to that special someone this year. 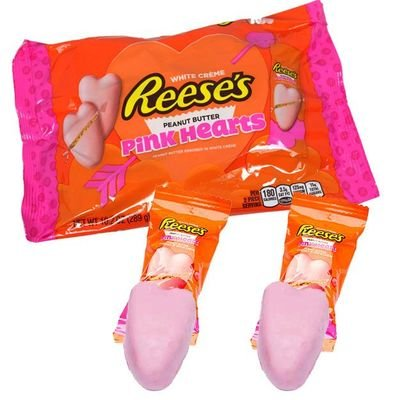 Reese’s pink Peanut Butter Hearts are one candy we’d recommend. They’re delicious Reese’s candy, so there’s no going wrong there. Another candy is Peeps hearts, available in several delicious flavors. These heart-shaped marshmallow candies melt in your mouth – absolutely delectable! On top of those, jelly hearts by Jolly Ranchers are also sweet little things and are available in packs to pass out to friends, family, and classmates. So when you bite into some of your heart-shaped Valentine’s Day candy in bulk this February, we hope you remember exactly how we got here. Browse all Valentine’s Day candy now at BlairCandy.com! At Blair Candy, it’s no surprise that we’re a fan of bulk and wholesale candy. We love that we’re able to sell you large quantities of candy at affordable prices. It’s really a win-win for you: you get more candy for your money and don’t have to break the bank for it. Furthermore, if you’re a business owner, you likely love candy in bulk because it’s an affordable option for stocking your concession shelves. Bulk candy is also a great option if you’re just one person who needs to buy holiday candy for a bunch of other people. In the context of Valentine’s Day, we’re thinking of how your child might need a lot of Valentine’s Day candy for his or her classmates. Or perhaps you just have a really large circle of family and friends and want to be able to surprise each of them with a sufficient amount of chocolates or other candy for each holiday. 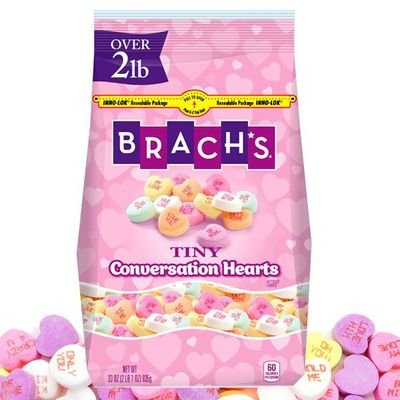 For example, in the photo above, you can see a two-pound bag of tiny conversation hearts from Brach’s. Sure, that’s a lot of little Valentine’s Day hearts, but you’ll love having so many delicious little candies bearing messages such as “Hug Me” and “Love You.” Or you can distribute these hearts into little baggies and hand them out that way. You’ve certainly got enough to work with when you’ve got candy in bulk! For Valentine’s Day, you have lots of choices for bulk candy. Interested in seeing them all? Head over to BlairCandy.com! There are a lot of clich’s associated with each holiday: you know, those things that everyone tends to expect, that you’ve seen or heard about a thousand times. And we’ll bet you know what those are. Think about Halloween clichés: you’ve got ghosts, skeletons, and witches. Christmas: snowmen, reindeer, and Santas everywhere. The same goes for Easter, with Easter bunnies, eggs, and spring chicks. The thing is, we’re not complaining about these things. In fact, we love them here! There’s nothing like a gummi eyeball in October or Santa in December. And in January and February for Valentine’s Day, you know you want to see flowers and chocolate. We’ll let you handle the flower bouquets, but we’ve definitely got the romantic boxes of chocolate for that special someone in your life. In the Valentine’s Day chocolate department, we’d like to direct you to Gardner’s peanut butter meltaways. Nothing says “I love you” more than a wonderfully sweet box of chocolates, especially ones this tasty. Each of these scrumptious squares is a milk chocolate shell encasing creamy peanut butter. Seriously, how could you refuse? 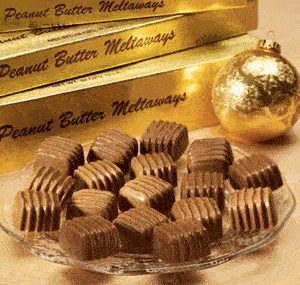 Luckily, we’ve got boxes of Gardner’s peanut butter meltaways in multiple sizes for your convenience, as well as Gardner’s assorted chocolates, meltaways, and chocolate-covered nuts. Any of these can be a lovely gift for him or her this Valentine’s Day. Browse all our Valentine’s Day chocolate right now on BlairCandy.com! One thing we pride ourselves on here at Blair Candy is our stock of bulk and buffet candy, which our customers have used for a ton of different events and occasions over the years. Now, we understand it’s January and it’s freezing outside (for many of us! ), but in the interest of staying on the positive side of things, let’s look forward to spring, when people love to get married. If you’re planning a wedding yourself, and need some diverse wedding candy for the reception, Blair Candy has a ton of sweets that you may find useful! • Broadway licorice sticks. Available in numerous colors, including pink, blue, and black! These are great if you’re going for color themes. • Jelly Belly jelly beans. 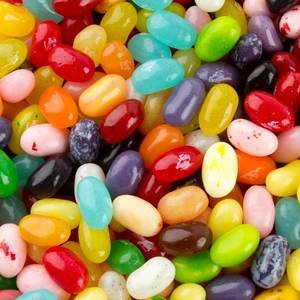 As you may know, jelly beans from Jelly Belly come in a variety of colors and flavors. You can get assorted rainbow colors, orange, brown, green…have your pick! • Gummi rings. These are fun because they come in multiple colors. Blue and white, green and white, and red and white are just some of the options you have with these delicious, sugar-coated little guys! And of course, don’t forget about candied chocolate balls, available in many colors that surely will give you enough to choose from for your wedding reception. The point here is, if you want to give yourself some ideas for the wedding candy you need, head over to BlairCandy.com! No matter how old you are now, you’ve probably got memories of lollipops from your childhood, or even in recent memory (hey, who doesn’t love a lollipop?). Lollipops are fun and delicious, and you can usually find a flavor for everybody in a group. Now that it’s January, we understand that a lot of children will be gearing up for lollipop fundraisers at their schools. And at this time of year, we say: why not theme these lollipops in Valentine’s Day colors to prepare people for February 14? If you love that plan as much as we do, then may we suggest some red lollipops and other assorted colored candy? 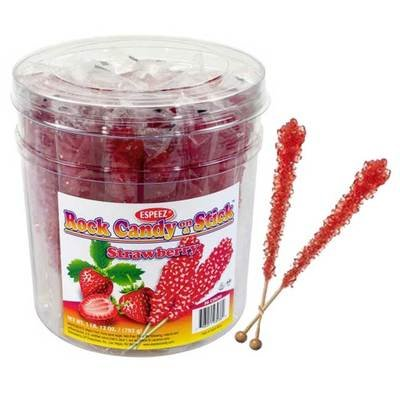 In this case, we first want to talk about the red rock candy sticks pictured above. These slender lollipops come in a 36-count canister and would be great for January fundraisers or just for passing out to classmates on Valentine’s Day. Other red and pink Valentine’s Day candy in bulk you can get from us includes lite pink and white whirly pops, colored candied chocolate balls, and Frooties in red colors such as cherry limeade, fruit punch, strawberry, and watermelon. All of this is really just a small sample of the red and pink candies we have that would be perfect as Valentine’s Day candy in bulk. For all our lollipop and Valentine’s Day selections, visit BlairCandy.com! There’s no shortage of candy options available all around you at Valentine’s Day. We’ve written about a lot of them on this blog, including red Peeps hearts, Reese’s Peanut Butter Hearts, and Brach’s conversation hearts. These are all quintessential Valentine’s candy, and they’re certainly popular for a reason. They’re sugary sweet and are decked out in classic Valentine’s Day colors of red and pink. • Sweet Beads. Give the gift of jewelry to that special someone this Valentine’s Day – candy jewelry, that is! Sweet Beads gives kids all they need to string candy bead necklaces and then wear them (and eat them). That’s a sweet valentine! 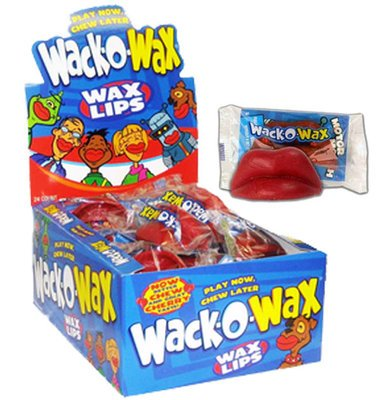 • Wacko-Wax Lips. These aren’t actually a candy, but they sure are perfect for Valentine’s Day! You bite down on the back of the lips, leaving nothing but a big, red mouth for all to see. Be sure to pose for photo ops after wearing these! • Cella’s Chocolate-Covered Cherries. These are a lovely and extra sweet candy that features either dark or milk chocolate coating a juicy cherry inside. Bite into one of these to enjoy the chocolate and wait as the cherry juice dribbles out. Absolutely delicious! These are just a sampling of the Valentine’s Day candy in bulk we’ve got available this year. Be sure to browse all our delicious selections right now at BlairCandy.com! Ah, weddings. They come around every once in a while in the lives of our family and friends, and of course it’s always fun (and a little stressful) to plan your own wedding. We love weddings for their elegance, the attention to every detail in that reception room. The tablecloths, the centerpieces, the lights, the food. Someone planned out all of this and likely, at some point, considered the nearly unlimited possibilities of color coordination. You know that one, we’re sure. Sure, weddings often involve some kind of white, but the bride and groom may also want to feature a certain color scheme. And if you’d like your wedding candy buffet or other setup to fit right into your theme, Blair Candy has you covered! As you can see from the photo above, we carry an assortment of colored candies that would be perfect to use as wedding candy. 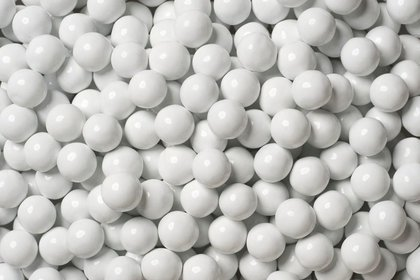 If you want bowls of candied chocolate balls scattered throughout the hall, you can choose from white, red, blue, yellow, pink, and many other colors. This vibrantly colored candy will look excellent as part of your wedding’s color theme, and all the guests will be impressed with your consideration of even little details like this. Aside from these colored candied chocolate balls, we have a range of other color-themed sweets that would make great wedding candy. Browse them all now on BlairCandy.com! With football being one of the most popular sports in the United States, it’s no wonder people love to go all out on food and other snacks when the big game comes on. You know what we mean: you plan everything out days ahead. If the game starts at this time, you’ll need to get the pizza, wings, chips, dip, soda, and various other odds and ends together right before that so you can be in front of the TV before the start. And when all those main foods are done and you’re looking for something to snack on throughout the rest of the game, what do you turn to? Well, at Blair Candy, we’re going to suggest none other than chocolate footballs! This sounds just perfect to us. Right from the R.M. 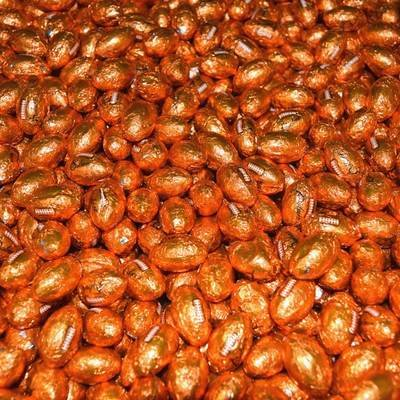 Palmer Co., our chocolate footballs are sold in bulk and come wrapped in little foil wrappers made to look like real footballs. Then unwrap them for a perfect bite-sized piece of football-shaped chocolate candy! You can get these in 2-pound or 30-pound varieties. That makes these chocolate footballs just right for some snacks at the house or for selling at your business’s candy counter. Be sure to order up your very own scrumptious little chocolate footballs before the next game, right from BlairCandy.com! Peeps are that kind of candy that just doesn’t get old, especially since they’re one of those brands that reinvent themselves into fun shapes and designs for every holiday. We all know and love the Peeps chicks for Easter, monsters and cats for Halloween, and snowmen for Christmas. They’re fun, adorable, and simply delicious, the sugar-coated marshmallow candy just melting in your mouth. Well, Just Born has done it again for the holidays with their Valentine’s Day Peeps, and we at Blair Candy are just loving every bit of them! Our own hearts melt for the holiday-themed strawberry creme-flavored marshmallow hearts. You get nine of those scrumptious little snacks in one pack, so we’re going out on a limb and calling that a fantastic deal. Another kind of Valentine’s Day Peeps you can get is the package of light pink vanilla creme-flavored marshmallow hearts. 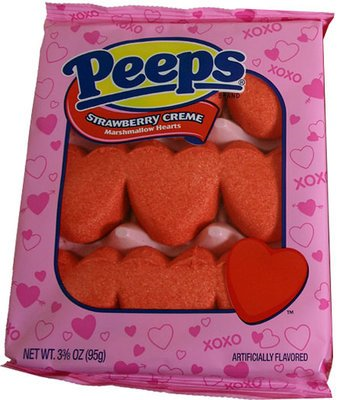 As with the red strawberry creme Peeps, these hearts are just making our mouths water as we think about them. And if we react that way, imagine how much your valentine will love them come February 14! Be sure to check out BlairCandy.com right now for all our Valentine’s Day Peeps and other assorted bulk Valentine’s Day candy! Valentine’s Day is certainly a great day for surprising the person you love with a nice, sweet surprise. Sometimes you have to get creative with certain people because they’re good at figuring out what they’re getting, or maybe they have just come to expect the same types of candy gifts from you. If that’s the case, we have the solution! As you’re shopping around for Valentine’s Day candy in bulk this year, look no further than the gigantic hollow Hershey’s Kiss! This beast has a shipping weight of about one pound and measures six inches wide and six and a half inches tall. It’s all wrapped in a giant silver foil wrapper and presented in a clear box. This is a truly exquisite candy that we think deserves such treatment, and that’s why it’ll so impress your valentine on this February 14. Whoever they are, they’ll be amazed by the sheer size of this Kiss, and will surely take their time eating it, making the sweetness last as long as possible. That’ll make this Valentine’s Day gift one they won’t soon forget! 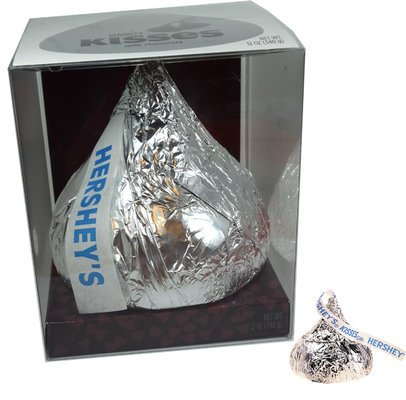 So give the gift of a Kiss this year: don’t conclude your Valentine’s Day candy in bulk shopping without picking up one of these giant Kisses, from Hershey’s and BlairCandy.com!